As part of its regular activities dedicated to presenting different music genres to its audience, on Wednesday 30 October, the French Institute at Mounira gave the stage to a classical music concert. On Wednesday 30 October, the French Quatuor Voce, a string quartet, performed three works, opening the evening with Turina, La Oracion del Torero. This short and poignant composition by the 20th-century Spanish composer Joaquin Turina, was followed by Hungarian composer Bela Bartok’s String Quartet No. 1, Op.7 and Beethoven’s String Quartet No. 14 in C sharp minor, op. 131. Many compare the Bartok quartet’s first movement to the fugal opening of Beethoven’s Quartet No. 14, hence Quatuor Voce’s choice of the two works. In his first quartet, Bartok depicts his obsessive, if not agonised, love for the Swiss violinist Stefi Geyer; he goes through the phases of painful searching, hope and even moments of joy, however challenged by the returning despair. Bartok was barely 30 years old when this composition saw the light (1909), yet his musical maturity was already evident. On the other hand, when in 1826 — one year before his death — Beethoven completed his String Quartet No. 14, he had already given the world many of his priceless, unparalleled compositions. Though when composing this quartet, Beethoven could no longer hear a single note, the work is widely considered an epitome of the composer’s musical maturity and depth. The music played by Quatuor Voce projects a rich texture which turns into a canvas for the musicians to paint their technical flawlessness and artistic wealth on. Each of the performers — Sarah Dayan and Cécile Roubin on violins, Guillaume Becker on viola and Lydia Shelley on cello — offered a captivating fabric. The Quatuor Voce’s dominant value is their plasticity built on several years’ polishing skills — to realise perfection. Founded in 2004, Quatuor Voce has witnessed rising popularity. A visit to Quatuor Voce website reveals a long list of commitments across Europe and beyond, along with an impressive number of international awards. 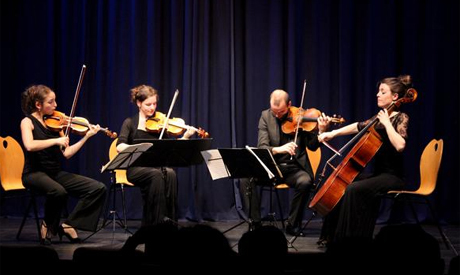 Proposed by “Cité de la musique” in Paris, Quatuor Voce was chosen by the European Concert Hall Organisation (ECHO) for the Rising Star Tour of 2013-2014. Their few-days visit to Cairo – their first appearance in Egypt – comes in the middle of this season’s many concerts in Brussels, London, Paris, Hamburg, Budapest, Luxemburg, Amsterdam, among other cities, always performing at the well known concert halls. Quatuor Voce’s visit to concert was accompanied by a one-day workshop at the Cairo Conservatory, during which the French musicians shared their experience with the Egyptian students. This educational initiative is linked to a cooperation initiative already developed in 2012, between the French Institute and the conservatory. The cooperation depends on a number of elements which aim at creating a solid three-year plan strengthening the link between both parties while offering artistic benefits for the young Egyptian musicians. Classical music is but a small part of the institute’s annual music activities. According to information provided by Charlotte Hiesse, responsible for communications at the French Embassy, one classical concert by a French ensemble is organised each year around October-November, but multiple activities reach out to a many genres, always aiming at developing a close collaboration between French and Egyptian musicians as well as bringing academic knowledge to the conservatory’s students and providing additional space for performances. On 20 November, on the initiative of the institute, the Egyptian Celio ensemble consisting of Cairo Conservatory students will give a concert at the Institute in Mounira. While the performance of the Quatuor Voce was no doubt one of the most interesting experiences in the classical music offerings of the city in past two weeks weeks, however, it might help to address a few issues regarding the logistical aspect of the French institute initiatives. The primary issue is to draw attention to the few disruptions that took place during the concert, whether they were voices calling out to each other outside the hall or a mobile phone ringing incessantly inside. While for the photographer silence means minimal motion on stage, to the music lovers a camera click can damage the whole journey. Though such incidents were not frequent, they managed to interrupt the mood created by the musicians.